The path of yoga can be undertaken by people in all different stages of their life. If you are brand new to yoga, you are in for a treat! Yoga is an ancient tradition and science which is beneficial for the body, the mind and the soul. If you want to join us for a class, please download and complete the Registration form below and arrive 10 minutes before class so we can show you around and say g’day and Namaste. For new students, $35 gets you 2 weeks of unlimited classes. This provides you the opportunity to try out a range of classes and see what suits you. The second option is a drop in class for $20 which you can purchase here. The registration form and your smile! We have all the props you need for the class, but if you prefer your own mat, feel free to bring it along. Comfortable clothes you can move freely in. Shoes are taken off before entering the yoga room. No bookings are required for yoga classes. However, bookings are required for workshops and private consultations. You can purchase passes online, or pay in cash or credit/debit card at reception. Your pass or membership begins on the first class that you attend at The Yoga Shack. What type of yoga is taught at The Yoga Shack? Hatha Yoga is the broad term used for any type of physical yoga. Our classes include a range of styles from slow and steady, to dynamic and flowing. Breathing is an important aspect in our classes, meditation is often included and every class ends in a deep relaxation. Which class do you recommend for beginners? “Hatha 1” is suitable for beginners as it includes the foundational yoga poses. 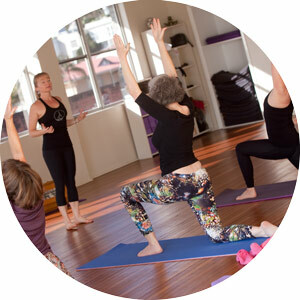 “Restore” is also available for beginners as it is a slower class where each pose has several variations appropriate for the unique and wonderfully different bodies in the class. Can I claim my yoga class? Yes, we have an NIB provider number that you can use to claim your yoga classes. Yes, we have a small carpark right next to the building, and there is usually parking available on the street (for evening classes). Woolworths carpark is also only a couple of minutes’ walk away from the studio. We will email you before your pass expires and inform you about our one-time special offer for new students, which is 15% off a 10 Class Pass or Membership. You can also continue to pay per class as a drop in student.